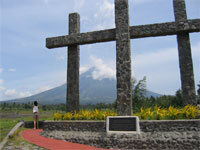 Tours and Holidays to Bicol in the Philippines. See Mount Mayon, and Whale Sharks at Donsol. 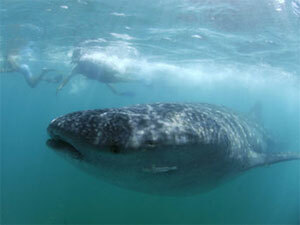 "We haven't stopped talking about swimming with the whale sharks!!! We will definitely be recommending the Philippines as a holiday destination to all our family and friends and of course we will be pointing them in the direction of Philippine Trails!" In the far south of the Philippines' main island, Luzon, lies the region of Bicol. Here you'll find the imposing Mt Mayon - the Philippines most active volcano, famous for its almost perfectly symmetrical shape, and with a crater that is almost permanently smoldering. Mt Mayon is one of two of the Philippines most active volcanoes in this part of the Philippines, the other being Mt Bulusan. A provincial tour of Bicol's Albay Province, visits the Cagsawa Ruins, Daraga Church, Embarcadero, Lignon Hill, Mt Mayon Rest House and Planetarium, and Tiwi Pottery, as well as the Abaca Handicraft and Pili Shops. See also the remains of the Padang barangay of Legaspi City, which was buried in a landslide of ash and giant boulders, following a typhoon in 2006. A more detailed description of the Albay Provincial Tour can be found here. When it comes to Filipino food, Bicol is one of the provinces where you'll find the best and most unique Filipino dishes. 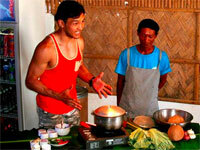 A Bikolinarya Culinary Experience will teach you how to make "Laing" and "Bicol Express" the traditional way! The Bicol province is the world’s largest exporter of Abaca fibre, more commonly known worldwide as Manila hemp. It is considered as the strongest among natural fibres. The Pili Nut is native to the Philippines and grows in abundance in the Bicol Region. Several local delicacies use the Pili Nut as the main ingredient and the Bicol province has a wide range of options for all tastes. Donsol has the highest density of whale sharks in the world! For decades, the seafaring natives of Donsol, Sorsogon have been living in the company of the butanding - huge, gentle whale sharks that live in great numbers offshore. The whale shark is the world's largest fish, and appear in Donsol waters in considerable numbers between December and May of each year, taking advantage of dense food concentration. Donsol is the seasonal feeding ground for whale sharks, and their arrival prompts the local community to provide interaction tours. Visitors even have the chance to swim alongside these majestic creatures. Away from the crowd and the usual tourist route takes you to Barangay Tuba - an agricultural village in Donsol, where you can interact with the locals and walk through a small forest. The highlight of this trip is a three-tier waterfall in which you can swim and enjoy nature. 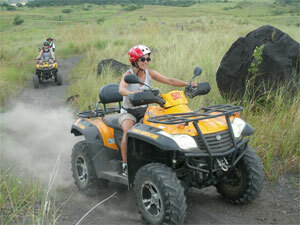 In Bicol, on the slopes of Mt Mayon, you can enjoy an ATV Adventure. Let us know if you would like to take part in experiences like this when requesting your tour or holiday in Bicol. Masbate is an island province located in the Bicol region. 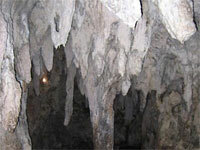 It consists of three islands - Masbate, Ticao and Burias. Masbate is the ranch capital in the Philippines, where cowhands on horseback herd cattle across a wide and beautiful landscape. During the annual Masbate Rodeo Festival cowboys and cowgirls display their skills inside a fenced arena. Masbate is also a melting pot of different cultures, and locals speak Minasbate, which is a mix of Bicolano, Cebuano, Ilonggo, and Hiligaynon dialects. Ticao Island Resort is a peaceful refuge close to several excellent dive sites. Some dive sites, like the Manta Bowl, are the cleaning and feeding stations of the Oceanic Manta. Waters such as Ticao Pass and Burias Pass are known for being plankton rich, with a constant current. This makes the waters of Ticao an alley for other pelagics like Whale Sharks, Thresher Sharks, Hammerheads, and Tiger Sharks. For more relaxing and colourful dives, visitors should head for the reefs of Ticao Island and that of other nearby islands. You're sure to be awestruck by the colourful creatures and corals. Discover a fast growing tourist area of South Luzon in Camarines Sur. Visit the city of Naga, explore the sandy beaches and islands of Caramoan, before heading west to Legaspi. 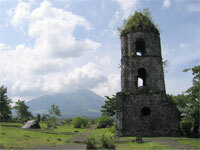 Both Mayon and Bulusan volcanoes allow trekking when not active. Bulusan Volcano in Sorsogon, is situated amidst natural rainforest, and we offer a number of Treks here, of varying length. Treks of 5 days, 4 days, 3 days, or simply overnight can be enjoyed, with the services of local guides. Bulusan has national park status and has become an attractive and diverse area to explore.